Just wanted to let you know how happy we are with the front garden you created for us. Initially though, I didn't think we would ever agree on a plan for the garden as we both had such different ideas. 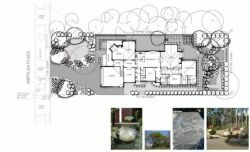 I was devastated after our first meeting when you, in no uncertain terms, told me how completely wrong a pillared fence was going to be for our garden, despite that being my vision from the inception of the house design. 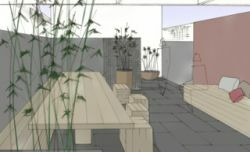 But the plan you came up with introduced some exciting new elements for the new garden whilst taking into account existing features as well as incorporating my ideas & we just love it! Each time I turn the corner & enter the driveway, it always seems like I'm seeing it for the first time. I can't believe I own this gorgeous garden! And every time I look at the centerpiece of the garden, that gorgeous stone wall, it takes me back to time spent in the north of Italy where my father grew up. The only aspect of the garden which I find disappointing is the fact that it's our front yard & whilst I often feel compelled to grab a picnic rug or banana lounge & spend time enjoying the garden on the lush green grass, I must restrain myself from doing so as I fear the neighbors may consider me 'showing off'!!! The comments we've had from friends, neighbors & complete strangers has been overwhelming. 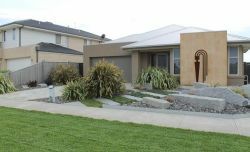 One lady commenting on how much we have increased the value of the property by creating a garden which compliments the style of the house so beautifully. So thank you for your effort & amazing ideas. For your perseverance when things where looking shaky & for all your tweeking. And especially for your patience in dealing with my indecision! And a big pat on MY back for having the good sense to hire a designer & not just a gardener. Because I could have hired anyone to build a garden, but you set a scene. You understood my vision for the house; a modern take on French provincial & placed the house in a garden setting that reflected that. Your architectural experience really came into play on this occasion. A big thank you also to your team, Kiel, Travis, Omar & Brett who executed the design in a professional & friendly manner considering they spent many of their days working in the rain. I have no hesitation in recommending your business to family & friends & look forward to working with you again in the future. Nicole Pellizzaro & Stephen Devenish.